Having been in the industry for some time now, I have not only seen how Business Intelligence (BI) and Analytics have matured, but also how the need for the succesful implementation of these technologies has become more apparent in most organisations. The amount of data that an organisation needs to deal with today has increased substantially. There has also been a significant increase in the use of information to actively manage and steer the organisation. Yet, there is still the uncertainly floating around about how effective BI really is and if it is worth the continuous spend? 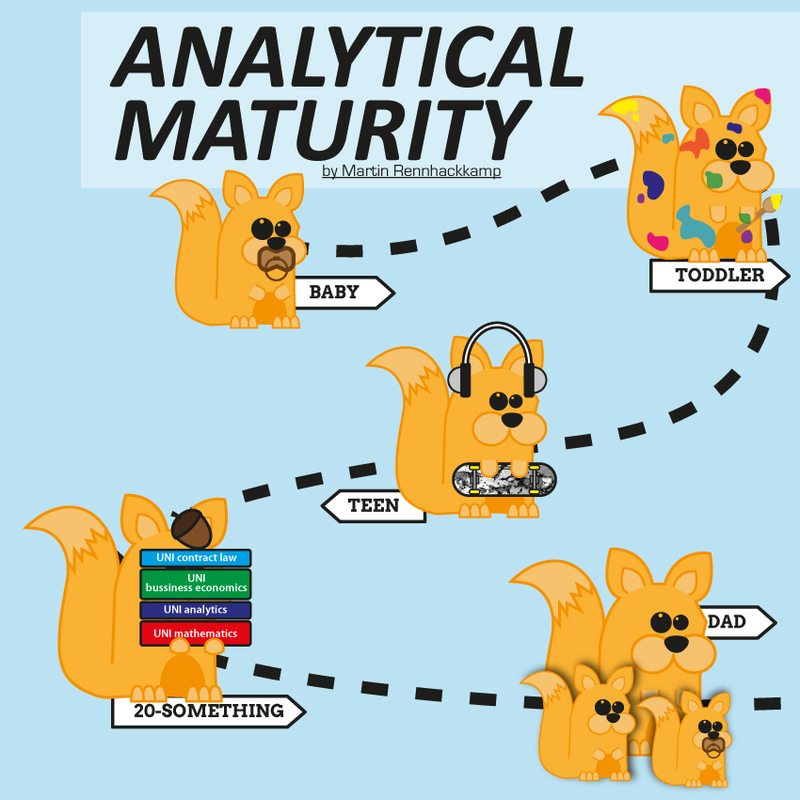 It is with this in mind that this post focuses on the topic of Analytical Maturity. I came across an article* that defines Analytical Maturity as not measured by how many analytical products you have acquired or even implemented, and less even about how sophisticated they are. In its basic form, they define the term ‘Analytical Maturity’ to refer to businesses being able to ‘get their business to its full optimal potential with minimal software development’. In other words, it means that the business should look to the current technological investments already made, ensure that these are working correctly and to their full potential, over just continuing to implement more and more software in an aim to solve a problem or ensure processes are running correctly. This definition contradicts the approach of some organisations that continue to acquire, install and deploy more and more advanced business analytic tools. Some organisations may already actually be at a point of analytics maturity, meaning that they could slow down their investment in software and their spend on related services while continuing to reap the value on their current investment – as they have reached analytical maturity. Measure: Processes to establish metrics, report these metrics and utilise them effectively in the applicable business processes. Business value: Processes to transition business questions to analytic questions, prioritise analytic activity, execute analytic requests and confirm that the information produced is utilised to generate business value for the company. Support: Processes associated with supporting the infrastructure and architecture implemented and the feeding of the analytics to the organisation for use. There are many “BI maturity” frameworks out there according to which organisations can measure the maturity of the implementation and adoption of BI. Examples include frameworks developed and published by Gartner, HP, Tableau and TDWI. They all have levels through which an organisation progresses as its BI capability is implemented, improved and the use of the resulting information is penetrated through the organisation and adopted in the decision-making processes. I mostly use the framework published by TDWI, because it is simple and well defined, and it includes the type of information provided, the toolsets (or infrastructure as they call it) utilised and the business value gained from those two. The TDWI Business Intelligence (BI) Maturity Model shows the stages that most organizations follow when evolving their BI infrastructure from a low value, cost-center operation, to a high value, strategic function that drives market share. This model provides the big picture of a BI program, where it needs to go, and how to get there. So what is the relationship between BI maturity and Analytical maturity, as defined above? 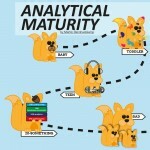 For me personally, although it very useful, the definition of analytical maturity above is not precise enough. The levels of BI maturity gives me a better indication where an organisation is on the journey to use the information produced, managed and distributed by the BI capability as a key organisational resource. However, what most of these frameworks do not address well enough is the cost-effectiveness of the BI maturity at that particular level. For example, an organisation (or department for that matter) may be at the Teenager stage of BI maturity, but it may have BI toolsets that are way under-utilised at that layer, or that may be way too expensive in terms of justifying the level of BI maturity achieved. That is where I would suggest using analytical maturity as it is defined above (and it can surely be labeled better then) to gauge the cost-effectiveness of the technologies used to get the organisation to that level. The variances between the analytical maturity indicators across departments also tell a story about the organisation’s overall BI maturity. Achieving analytical maturity is not easy – because, let’s face it, adopting BI as a strategic direction is complex. Not only does it include the technical aspects such as architecture, implementation, infrastructure capability and toolset functionality and limitations, but also the non-technical aspects like people and processes. A single aspect like data quality can seriously hamper the progress of maturity. Enterprise BI should cross most business functions, but various departments can be at quite different levels of maturity. Executives also may have quite different perceptions of the organisation’s analytical maturity, depending on the usefulness and relevance of the data dished out to them. Despite the formal frameworks, and defined levels of maturity, there is no golden-ticket roadmap through that labyrinth, because not every organisation follows the same path of evolution and some organisations or departments do not even pass through each level. So analytical maturity is above all about ensuring that a business’s current technology investments are working and working well for the business. This can play a contributing role to increase revenue, or to save valuable time and money. It’s about creating that balance needed by focusing more attention on maturity in terms of analytics, to avoid chasing the next big trend in technology and software unnecessarily – and first reap the ROI businesses want to see from their current technology investments today. I will admit that I am the first to encourage businesses and decision makers to thoroughly understand concepts and technologies, and to carefully consider whether their business actually needs these, before embarking on any big-scale implementation. However, I also firmly believe that information is a business enabler that can give you a significant competitive edge – be it to oil the internal processes better, understand the competition and the market better and/or to identify and service the customer better. In terms of measuring the cost-effectiveness of a particular BI toolset at a particular level, analytical maturity (as it is defined above) is definitely useful. However, I would label it something in the line of “BI toolset utilisation”. Maturity growth involves big changes in the organisational culture and it affects many business processes – it usually needs to be driven through a strategic initiative. The organisation must also be willing for the investment required to set up and implement a BI strategy in order to get the desired growth in maturity. It seems that “value to the business” and ROI always creeps in somewhere in the maturity discussion. Although ROI is not a measure of overall maturity per se, it definitely plays a key role in determining whether analytical maturity has been achieved on a particular level of BI maturity. I will cover the ROI on BI initiatives in a subsequent post, as it is an extensive topic.